Strange Case was built for people who like the original Jekyll theme Hyde and its port to Hugo but prefer to use Bootstrap. The theme was built from an empty Bootstrap 3 template with the goal of easy modification for end users. The code is as simple as possible - clearly formatted HTML and a single stylesheet. It’s a two column responsive design and currently includes version 3.3.7 of Bootstrap. Installing Strange Case is easy. Simple clone this repo to themes/ in your Hugo folder. 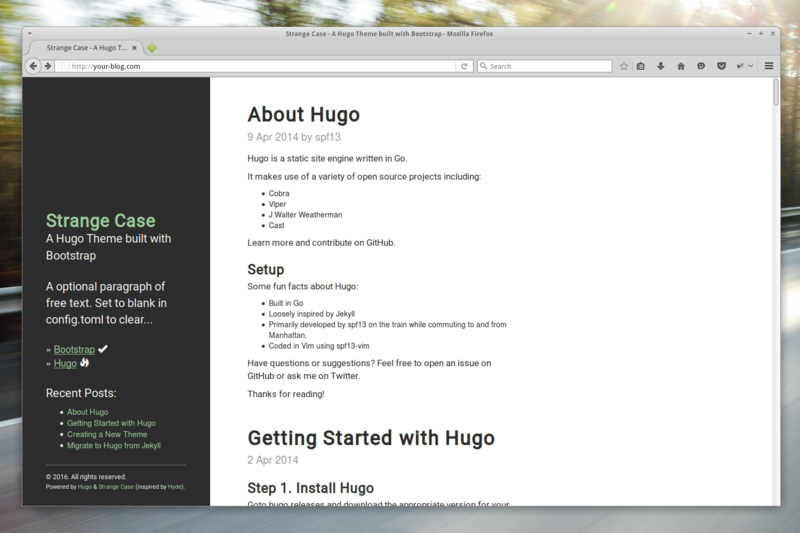 Next, open the config.toml file in the base of the Hugo folder and ensure the theme is set to strange-case. There are various options you can easily set from your config.toml file. description = "A Hugo Theme built with Bootstrap"
sidebarDescription = "A Hugo Theme built with Bootstrap"
This text will appear in a free paragraph below the Title & sidebarDescription and above the menu links. Set it to “” if you don’t want it. sidebarFreeText = "A optional paragraph of free text. Set to blank in config.toml to clear..."
post = "<span class='glyphicon glyphicon-fire'></span>"
You can optionally use the pre and post vars to include HTML before or after the name in the resulting links. You can use the "contact_email" field in [params] to set a mailto: link the in the sidebar. Leave blank if you don’t want it. In keeping with our attempt to replicate the original Hyde in Bootstrap we’ve included some colour scheme options. These are not the same as in the original, but we used palettes from the same Base16 project. 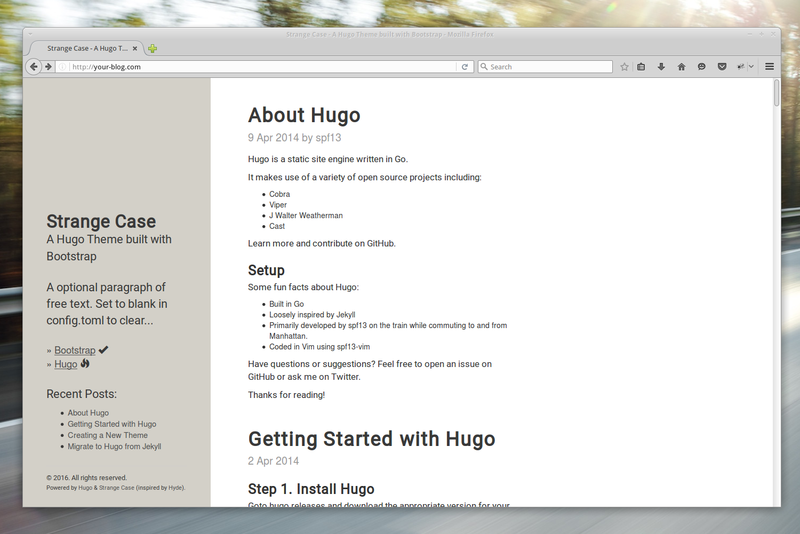 title = "Strange Case Hugo Theme"
DateFormat = "2 Jan 2006"
To create your own custom color scheme simply scroll to the end of the strange-case.css stylesheet in the your-hugo-dir/themes/strange-case/static folder and edit the template we’ve left there. We’ll happily accept pull requests for quality color schemes. This theme supports Hugo’s native GA integration & a Piwik integration. title = "Your Blog Title"
description = "A blog about content"
sidebarDescription = "This is my blog about content"
post = "<span class='glyphicon glyphicon-ok'></span>"